The TIWAL 3. 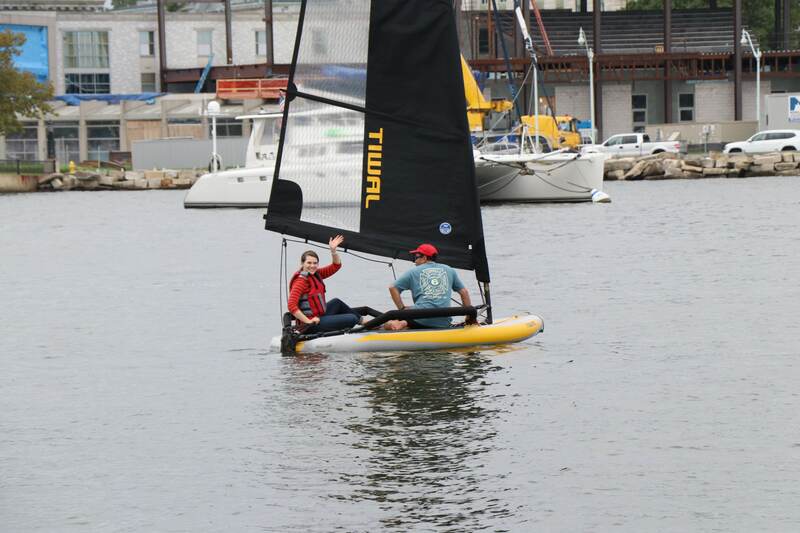 Our inflatable sailboat test ride at the Sailboat Show in Annapolis was the highlight of our week and we can’t wait to get back on the water with this gem. It all started out with our article Inflatable Sailboat, Say What? we wrote as request from some of our readers who wanted to know more about inflatable sailboats. We didn’t know much at first, but as we started doing our research it was easy to see that TIWAL was on the top of everyone’s list, and for good reason. TIWAL is the invention of Marion Excoffon, who dreamed of being able to fold up her sailboat and take it with her. After several prototypes, she showed off her first TIWAL sailboat at the 2012 Paris Boat Show. Ever since these boats have been flying off the shelves making sailing more accessible and portable all of over Europe and the United States. We were lucky enough to run into the TIWAL team at the 2018 Annapolis Boat Show. As soon as they asked us if we wanted to take a TIWAL 3 for a test ride we jumped at the chance. We had high expectations going in since we first learned about them and their pioneering efforts in inflatable sailboats. We are happy to report that our expectations were met and exceeded. We watched closely as they set up the TIWAL 3 in a matter of minutes. The TIWAL 3 was easy to set up and easy to sail. A simple mainsail and tiller help you captain the boat like an expert in a matter of minutes. We were out in very light wind during our test ride, but we were told that on windier days you have to sit up on the aluminum bar and sometimes stand to balance the boat. It is capable of capsizing, but righting it solo is doable which makes it attractive to novice sailors, kids and kids at heart. You don’t need to worry about the headbangers during tacks and jybes since the TIWAL 3 has no boom. Our thirty minutes on the water with the TIWAL 3 was the highlight of our day at the Annapolis Sailboat Show. Overall, we loved our time on the TIWAL 3 and it now has a solid place on our Christmas wishlist. Check out our video below to see our Test Ride and how to set it up. For more information visit TIWAL.com.